There’s something very surreal about seeing the Hylian Shield used to violently smash a bandit’s face in. I mean, sure, in The Legend of Zelda Link slays plenty of goblins and beasts and even the occasional human-like baddie – but Skyrim’s violent execution animations really are another thing entirely. 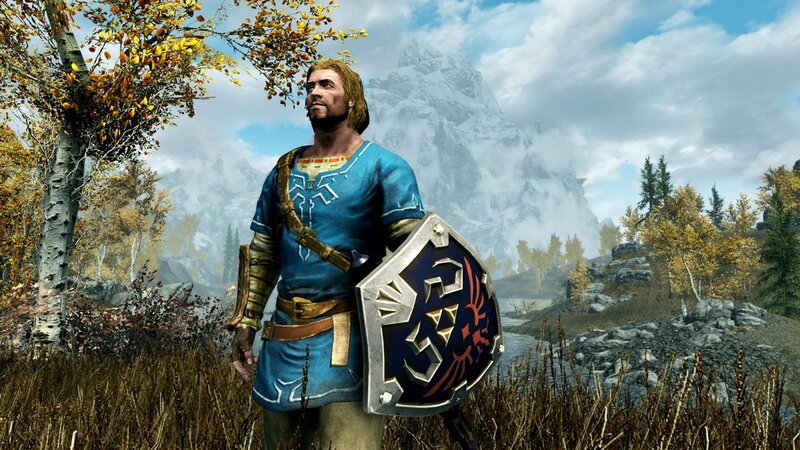 Seeing Zelda gear in that setting is just one reason why you might want to grab the newly-added The Legend of Zelda themed gear in The Elder Scrolls V: Skyrim for Nintendo Switch – and we’re here to help you do just that. The Zelda gear in Skyrim on Switch is available in two different ways – the first requires you to be a dedicated Zelda fan willing to have opened your wallet to Nintendo’s nefarious amiibo system. 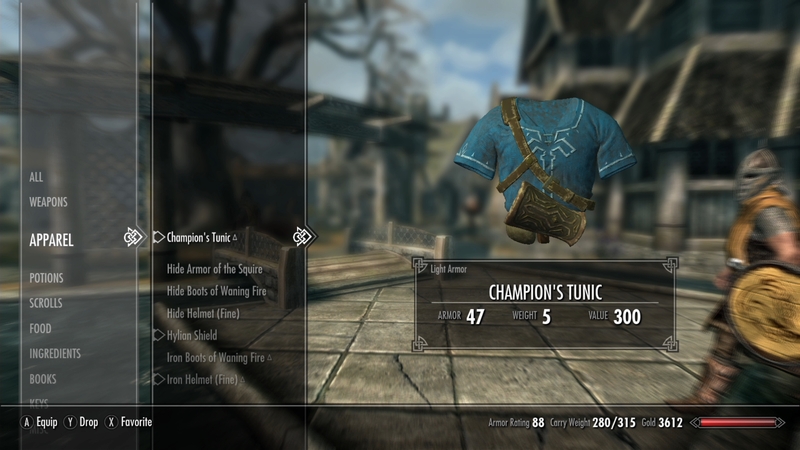 Nintendo has a little rule that you can’t lock important stuff behind amiibo outright, however, so you can find the Zelda gear out in the world of Skyrim in general if you’re inclined to go searching. Skyrim is compatible with pretty much all amiibo out there. Mario, Sonic, Cloud Strife, K.K. Slider – they’ll all work. When scanned, each amiibo will give drop a treasure chest containing a random selection of in-game loot that could include weapons, armor, ingredients – anything from Skyrim’s absolutely enormous loot table. Gear that drops from amiibo will be level-appropriate for your current character. You can scan amiibo once per real-world day. In order to use the amiibo, you’ll need to equip it. Unlike in Zelda: Breath of the Wild this isn’t a menu option, but is rather formatted as a spell-like power that can be found in your magic menu alongside your shouts and other special moves. To access it, press B to bring up the menu and then press left into the magic menu. From there, select ‘powers‘. In here you’ll find an amiibo power. Once equipped, you activate it with a tap of the R button (R1/RB). The Champion Tunic from The Legend of Zelda: Breath of the Wild. It’s light armor in Skyrim. 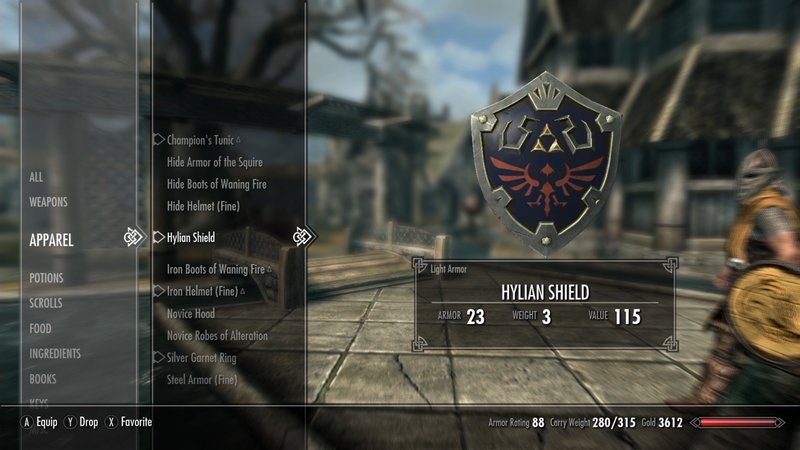 The Hylian Shield, in the classic design it’s taken on from Ocarina of Time onwards. 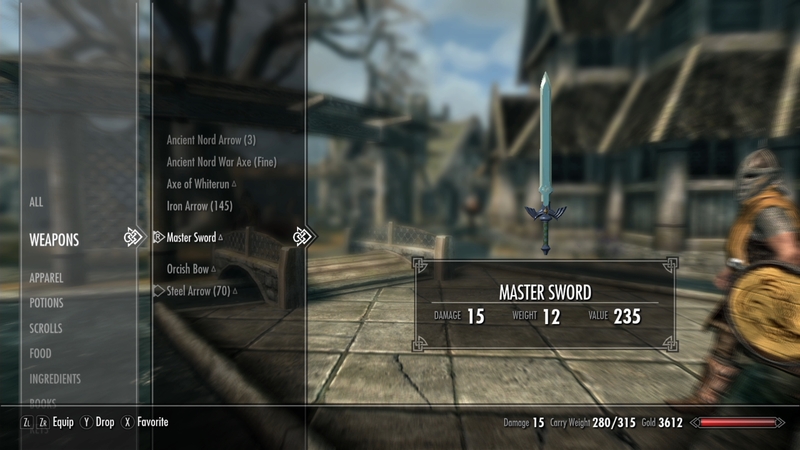 The Master Sword, the blade of evil’s bane, which has featured in Zelda pretty constantly since A Link to the Past. The quality of this gear depends on your level at the time the chest is opened, and there’s a 20% chance that one of these items will be inside a chest dropped after a Zelda amiibo has been scanned. If you don’t have any Zelda-branded amiibo to hand and don’t intend to buy any, the Zelda items are still available in Skyrim on the Switch naturally – but only once, and you won’t be able to get them without traversing a dangerous area of Skyrim. 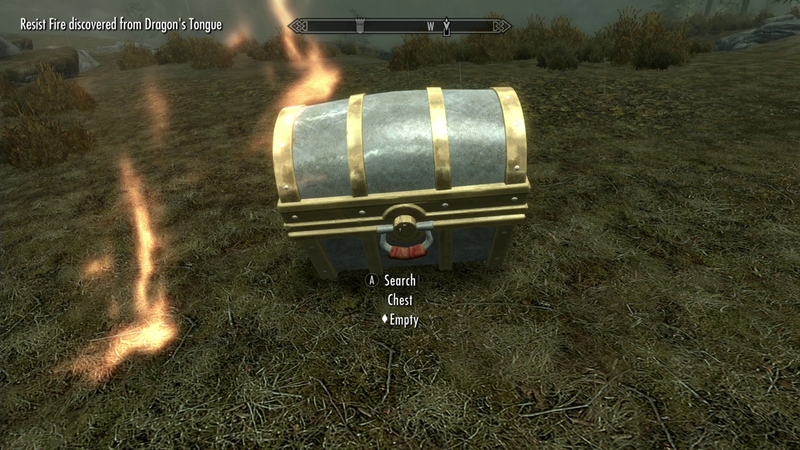 A chest containing all three of the Zelda items – the Master Sword, Hylian Shield and Champion’s Tunic – can be found at The Throat of the World, the tallest peak in Skyrim. This area is home to some dangerous enemies, so we’d recommend being at least level 10 before you attempt this. Keep in mind too that this is your only chance to get these items and their strength will again be scaled to your level when you pick them up – so you might want to hold off until later.